How do companies present their vital resources in annual, quarterly, and corporate citizenship/sustainability reports and also in other publications and on their web sites? Do they provide a coherent, consistent, and convincing view of resources like management quality, brands, and intellectual capital? And how should they proceed to make stakeholders grasp what makes them a valuable investment, a preferred supplier of goods and services, or an employer of choice, and also a good corporate citizen? These are the core questions addressed in Reporting Nonfinancials. The book presents both best practice in nonfinancial disclosure and a pragmatic framework for action. It shows practitioners how to optimize the impact of their intangibles by first analyzing their companies’ strengths and then improving their disclosure through annual, quarterly, CSR, and other reporting formats. It also helps investors and other stakeholder groups evaluate the quality and relevance of information provided by companies. Thus it is important for both executives and outsiders. KAEVAN GAZDAR is responsible for Reporting at HypoVereinsbank, one of Germany´s largest banks. Its Annual Reports received the prestigious manager magazin awards six times in succession; its Sustainability Reports have also won national and international prizes. 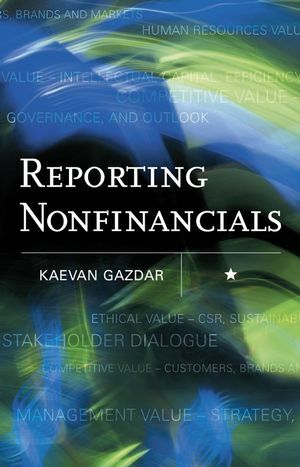 Kaevan is co-author of books on reporting and corporate citizenship. He is a member of the international jury of the Annual Report on Annual Reports, a global reporting ranking, and also belongs to the jury of the Good Company ranking. Apart from this, he has written for magazines like Investor Relations and Ethical Corporation and lectured widely in Europe. Introduction: Goodwill and Blue Skies? Getting a Grip on Nonfinancials. Closing the gap between book value and market cap. Step 2: Adjusting to regional priorities. Step 3: From consciousness to action. 1 True and Fair View? The Glaring Deficiencies of Financial Reporting. The old economy’s reporting paradigm. Getting form to follow function. Nonfinancials: The overheads of the 21st century. Nonfinancial Reporting between Pressures, Paradoxes and Potentials. Pressures: Regulators, investors and public opinion. Paradoxes: A singular lack of clarity and concreteness. Potentials: Professionalisation on the march. A. BRANDS: ENGINES OF GROWTH AND REPUTATION. ...and reporting on brand equity. Rescuing the brand: Reporting as a part of crisis management. B. CUSTOMERS: THE KEY ENTREPRENEURIAL ASSET. Customer orientation: Beyond lip worship. Customer satisfaction: Early warning system or success barometer? Customer commitment: Showing true grit. C. MARKETS: TARGETING NICHES, SEGMENTS AND SECTORS. A. STRATEGY: AN AMALGAM OF PROCESSES AND VISIONS. ...and as an exercise in restructuring. ...and his insights on markets – or hers. B. GOVERNANCE: SHADES OF TRANSPARENCY. Regional pressures and structural differences. Are governance premiums sufficient incentives for coherent reporting? C. OUTLOOK: FORECASTING AS THE ULTIMATE CHALLENGE. Inputs and outputs: Systematising forecasting. Uncorking the champagne – or biting the bullet. Paths to growth and glory: Unorthodox approaches. Can people be capitalised? Ambitious concepts, modest results. A. PRODUCTIVITY: PROMOTING EFFECTIVITY AND EFFICIENCY. Ways to productivity: The cultural factor. B. MOTIVATION: WILD CARD FOR EXCELLENCE? Corporate culture: The backbone of motivation. C. POTENTIAL: PROTECTING PROPERTY AND HARNESSING TALENTS. Exploiting intellectual property: Defensive and offensive approaches. Training: An investment in superior performance. CSR, Sustainability and Stakeholder Dialogue. Evolution of reporting: From accounting to assurance. A. CORPORATE SOCIAL RESPONSIBILITY: CHARITY OR POLICY? Reporting trends: Quantity and quality on the rise? ...and concentrating on core business. B. SUSTAINABILITY: BETWEEN TRIPLE BOTTOM LINE AND REALISTIC TARGETS. Reporting between minimalist requirements and maximalist demands. Setting targets and executing strategies. C. STAKEHOLDER DIALOGUE: CONFLICT-SHOOTING OR WIN–WIN STRATEGY? Ethical value: A must or a sham? Addressing Stakeholders and Facing Issues. Dialogue as an ongoing process. Dialogue perspectives: From evasiveness to civic sense. 8 New Wine in New Bottles? Strategy: From fundamental questions to an integrated approach. Structure: The road to clarity and materiality. Style: From story-telling to substance.